What Causes Foundation Problems In Arizona? Poor Soil Conditions: Poor soil and its expansion and/or contraction contribute to foundation failure. Evaporation: Hot, dry wind and intense heat will often cause the soil to shrink beneath the foundation. This type of settlement may cause cracks to appear throughout the structure. Drainage: Improper drainage is one of the leading causes of foundation failure. Excess moisture will erode or consolidate soils and cause settlement. 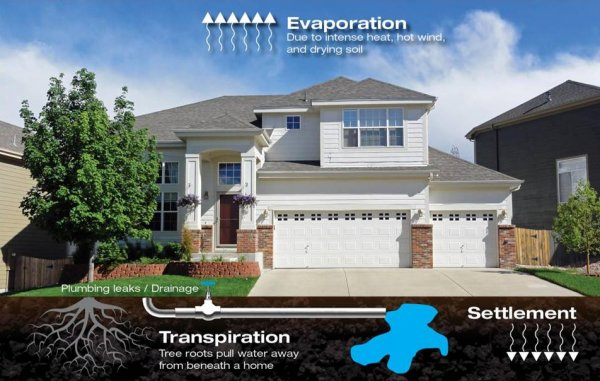 Transpiration: Tree roots may desiccate the soil beneath a home causing the soil to shrink and the home to settle. Plumbing Leaks: Water from plumbing leaks is often a cause of foundation problems. Inferior Foundation Construction: Insufficient steel and inferior concrete (support) will contribute to movement in the slab. Inferior Ground Preparation: Soft, low density soils and/or improperly compacted soil beneath a home is the leading cause of foundation failure. Cut and fill situations should be properly prepared before the soil is ready to support a structure. If you see any of these foundation warning signs, it may be time to get your foundation problem inspected. Don't wait until it's too late, call or contact us today and let Arizona Foundation Solutions help you keep a healthy foundation!